Quaywest 2 - 1067 Marinaside Crescent, Vancouver, BC - Urban City Rentals Inc.
Quaywest at 1033 and 1067 Marinaside Crescent was built by Concord Pacific. Located across the street from the seawall, steps to Urban Fare, Costco, BC Place, GM Place, Yaletown shopping and restaurants. The complex offers great facilities including indoor pool, steam room, sauna, gym, media room, kids playground and 24 hour concierge. 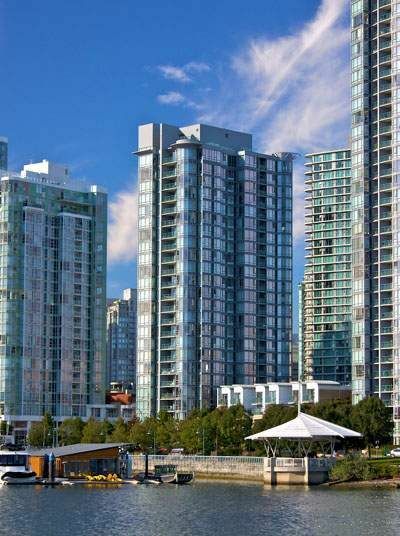 Some units have views of False Creek, Olympic Village, the city and Mt. Baker. The complex features 406 units with 223 condo units and 7 townhouse units at 1033 Marinaside, 132 condo units and 13 townhouse units at 1067 Marinaside, 31commercial units.